Wilhelm Schickard (1592-1635) must take the credit for producing the first mechanical calculator or Calculating Clock as he called it. The device had an upright frame holding a set of Napier's bones and a mechanical counting device in the base. Until relatively recently, nothing was known of this, but during an examination of the papers of the astronomer Johann Kepler, a letter from Schickard to Kepler, which had been written in 1624 was found. This letter had a description of a calculating machine and a rough drawing. Apart from this tantalising fragment, little else was known about it until the late 1950s when more details were found. These were sufficient to enable the device to be reconstructed. Schickard's letters mention that the original machine was accidentally destroyed in a fire, while still incomplete. It is thought possible that Schickard may have made a second machine, but no trace has survived. Schickard died of bubonic plague in 1635. Blaise Pascal (1623-1662), had a father who was an overworked and harassed tax commissioner in Rouen. 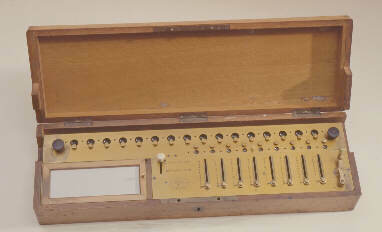 The young Pascal devised a mechanical calculator to help him with his work. Pascal started on the project in 1642 when he was 19 and three years later he had a working machine, the Pascaline. The Pascaline was quite limited; it could add with some difficulty and subtract with rather more, but that was about all. Multiplication and division were beyond its capabilities. Pascal was eventually granted a patent for his machine and it was produced on a very limited scale. This was partly because of the expense of the device and partly because it was inherently unreliable and very prone to jamming. Although Pascal has been ousted from his position of inventor of the first calculator, this should not diminish his achievement. It is very unlikely that he was at all aware of the work of his predecessor. Gottfried Wilhelm Leibnitz (1646-1716) Is perhaps best known for his work on the calculus and his subsequent priority dispute with Newton, but he also constructed a calculator, the Stepped Reckoner, which employed the stepped gear principle. This principle has been used in many more recent machines. 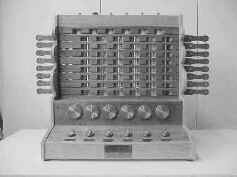 The Stepped Reckoner was much more complex than Pascal's machine and could perform all four of the basic arithmetic functions. It also had a logical design fault in the carry mechanism which was not discovered until many years later. The stepped gear or Leibnitz Wheel consists of a cylinder having 9 gear teeth of varying lengths. A sliding gear can mesh with these teeth. Depending on the position of the sliding gear, it may be advanced by any desired amount when the cylinder is rotated one complete turn. 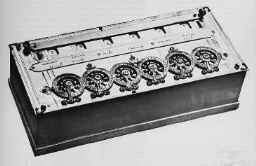 Charles Xavier Thomas de Colmar (1785-1870) made the first practically successful calculator, the Arithmometer . This worked on the stepped gear principle of Leibnitz and could perform all four basic arithmetic operations. Numbers may be entered by moving the sliders in the slots seen at the lower right of the device. A stepped gear is housed behind each slot. 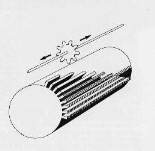 The gear train of the arithmometer was driven in the forward direction only and could perform addition and multiplication. To perform subtraction or division a reversing gear had to be engaged. The first patent for this device was granted in November 1820. Derivative devices were still being manufactured after 1900 and some were still in use in the 1940s. Text Copyright © 2002 A.Audsley.